Alfie Briggs took a sixth place finish in his first Junior race at Shenington’s first meeting of the season. It came in the MiniX class and he started well in third place. 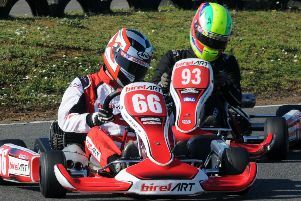 Oliver Greenall pulled clear of Luke Watts at the front but by then Briggs had lost a couple of places, he dropped to seventh but finished sixth after Milo Pifold was penalised five seconds. Watts caught and passed Greenall but the positions were reversed again by the last lap. Greenall beat Watts and Theo Micouris. A front row start in TKM Extreme for Over Norton’s James Pashley was squandered when he ran wide out of the first corner, dropping him to sixth. The lead was maintained by second row starter Spencer Stevenson who had jumped ahead of the pole-sitter Jack Ransom but both were leapfrogged by Joshua Sherriff. Sherriff took the win over Ransom and Stevenson while Pashley could not quite make an impression on them. The 8-13 year-olds four-stroke Honda Cadet final saw Connor Duncan lead Ethan Symonds, Sonny Smith, Mitchell Gibbons and Josh Agambar in the leading group. Duncan and Gibbons dropped back as Smith went out ahead only to be reeled in by a resurgent Duncan as Gibbons had a brief off in the chicane. The finishing order was Smith, Agambar, Symonds and Duncan with Banbury’s Jack Stewart 12th. In the other Cadet race for the two-strokes, Aiden Neate enjoyed a lights to flag victory over Leo Robinson and Archie Clark. As Sam Heading led George Dimitrov and Daniel Guinchard away in Junior X30 for 13-year olds, several karts crashed bringing out the pace flags. Once the race re-started Stratford’s Alessandro Ceronetti reached third place. Heading and Dimitrov were unchanged at the front, while Guinchard was docked a lap for overtaking on a yellow warning flag. In the Junior TKM final Connor Kearney and Ben Watson were the initial leaders, Zak Oates was soon in the mix and dicing hard. Louis Harvey joined in and by the end Watson was defending hard. Kearney dropped to fourth, in favour of Harvey with Oates third. Rufus Hunt was in a class of his own in Senior X30, winning by a large gap over the battling Tom Nippers and Michael O’Brien. And in Libre, Clive Carpenter raced through the TKM Clubman drivers to win on the road with Rotax power over best Clubman Will Hullacki.